People often ask me what my favorite Chinese cookbook is, and I never can give a simple answer. For one thing, I collect them, and have well over a hundred different titles at this point, some of them brand new, in-print books, and others out of print, some of them even vanishingly rare. For another thing, I like different books for different reasons. Some books are excellent teaching manuals; they give the beginner excellent instruction in the fundamentals of the art of Chinese cookery. Other volumes teach one aspect of Chinese cookery, such as dim sum, and do it well. Some are great generalized cookbooks, while others focus on a particular single regional cuisine. Some contain clear photographs illustrating techniques and ingredients, others have beautiful scenic photographs, while others are not illustrated at all. One commonality to all of the cookbooks I favor, Chinese or otherwise, is that they give a great deal of cultural information. Every recipe has a story, and my very favorite cookbooks are written by authors who are not only excellent cooks and teachers, but also accomplished storytellers. That is why nearly every book on this list, with a few exceptions, are not only good cookbooks for those setting out to learn Chinese cuisine, but also darned good reads for anyone interested in the culinary arts in general. Without further ado, here are some of my favorite Chinese cookbooks meant to instruct beginners, in no particular order, which I think will be helpful and entertaining to beginning and intermediate cooks. The Key to Chinese Cooking by Irene Kuo: This excellent comprehensive cookbook is unfortunately out of print; however, used copies are easily found at good prices via Bookfinder, Amazon, or eBay. Kuo’s precise prose carefully explains the techniques of Chinese cookery in an easily understandable step-by-step format that is illustrated with clear line drawings. Comparable in scope and detail to Julia Child and Simca Beck’s Mastering the Art of French Cooking,, this text is very strong on learning technique, particularly proper cutting and ingredient preparation. With over three hundred recipes (for both simple and complex dishes), many of them requiring simple ingredients, this gem is a perfect introduction to Chinese cooking, even for cooks who have limited access to an Asian market. Each recipe is clearly written and includes relevant cultural and historical information, as well as thorough background on ingredients and successful substitutions. The Modern Art of Chinese Cooking by Barbara Tropp: Another great introduction to the Chinese kitchen, The Modern Art of Chinese Cooking stands as an enduring legacy of the late writer, chef and restaurateur, Barbara Tropp. Not only was Tropp a great chef and teacher, she also told great stories of her experiences in China, many of which were humorous or poignant. In addition, her clear instructions delineate the hows and whys of Chinese cookery, while presenting recipes which are not only authentic in flavor, but are still quite accessible to Western palates. Some readers may criticize her instructions and methodology for being long-winded and needlessly wordy, but I disagree. Her explanations of technique are not wordy, but -complete- with the sort of clear writing necessary to explain complex series of tasks to rank beginners. Anything less thorough runs the risk of losing new cooks. My one quibble with this book is that it lacks sufficient photographic or line-drawing illustrations. Many people learn visually, and I have found in my years of teaching that some students can read a passage of text one hundred times and still have trouble folding a wonton or cutting grass-like slivers of ginger, but when I show them how just once, they understand it completely, and can take their first steps in replicating the action immediately. Yan-Kit’s Classic Chinese Cookbook by Yan-Kit So: For those who learn visually, this heavily-photograph laden cookbook is the answer to a prayer. Every technique outlined in this book by Yan-Kit So’s simple, elegant prose, is illustrated by clear, close-up color photographs. Most recipes are similarly illustrated, though not all of them, and every unusual ingredient, particularly the fresh and dried condiments and vegetables, are also photographed. However, this is not just a photographic reference book; it is also a very well-written overview of modern Chinese regional cookery that includes recipes famed in China and abroad. An extremely useful book, this one is destined to be well-thumbed and bespattered with soy sauce and various other condiments from becoming indispensable in the kitchen. The Breath of a Wok by Grace Young: Some may think this is an odd choice for a beginner’s Chinese cookbook, and in some ways it is. However, I think it is very useful for a student to understand the history and the culture surrounding a cuisine at the same time as they learn the more practical aspects of it. In this light, The Breath of a Wok makes much more sense; it is both a personal and historical view of the culture surrounding the development and use of woks in Chinese cookery. The recipes included in the book are an eclectic mixture of homestyle cooking and restaurant fare, with examples of traditional interpretations and modern innovations. In a sense, this very stunningly illustrated book is a testament to the enduringly ancient, yet flexible nature of Chinese cookery, both in its homeland and around the world. In addition to narrative about the wok in history, there is extensive information on how to find and buy one in the here and now, as well as instructions on how to cook in one on a modern American stove to most effectively attain wok hay–the elusive fragrance that comes from high heat and oil-seasoned metal. The Chinese Kitchen by Deh-Ta Hsiung: This book is less of a cookbook, and more of a reference work on the ingredients common to the kitchens of China. Liberally illustrated with clear photographs, Hsiung’s text is encyclopedic in scope and very easily read and used by a beginner. Filled with cultural information, cooking tips and with recipes for each ingredient entry, The Chinese Kitchen gives the beginner a verbal and visual reference point to many of the unfamiliar staples, foods, condiments and packaged goods at the neighborhood Asian market. The descriptions are written so as to give plenty for the curious beginner or intermediate cook to chew on without being overwhelmingly technical, and the photographs, whether of the ingredients themselves, of finished dishes or of Chinese open air markets, are enlightening and inspiring. I cannot recommend this book enough–it is one that I return to often as a cook, a writer and a teacher. 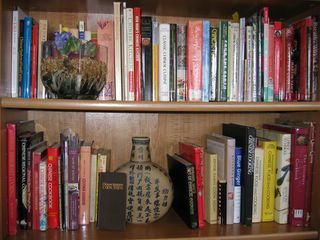 There we have it–my favorite Chinese cookbooks for beginners. Look for further entries in the future on the subjects of Chinese cookbooks for advanced cooks, for instruction on regional cookery and cookbooks on specialized topics. Until then, happy reading, cooking and eating! I am like this about Indian cookbooks. I collect them, and on my recent trip to India came back with a BIG bag of them to mull over. Ahhhhhhhhh….. This is great for me. I’m not experienced at all with Chinese cooking, and I’m very interested in it. Growing up, my mother did all the Chinese cooking in the house, and did it wonderfully. I’m sorry I didn’t pay closer attention to her. I’m going book shopping! Thanks for this really informative article. I’ll see what I can find on Amazon. Diane–I collect Indian and Thai cookbooks, too. I just don’t have as many of them as I do Chinese cookbooks! I am glad to see that the list has been useful to everyone! Happy book hunting! Fuscia Dunlop’s Land of Plenty is also great for various levels. Her Chinese recipes are fantastic and beat restaurant food anyday. I’ve heard good things about her new Hunan book too. Kady, I love both of those cookbooks–I have reviewed them both here, in fact! I am going to include them in another list of favorite Chinese cookbooks. I was going to do a general “my favorite Chinese cookbooks” post, but it just kept going, and going, so I decided to break it up into several categories. Dunlop’s works will go into the “regional Chinese cookbooks” category. Wow! I just got “The Chinese Kitchen” by Deh-Ta Hsiung, and realized to my great pleasure it is by the same publisher, and in the same format as one of my favorite cookbooks – “The Indian Spice Kitchen” by Monisha Bharadwaj. That one is sadly out of print (mosre sadly so since mine fell in the sink and is now all battle-scarred and water stained and pages warped from water). Both seem to be less cookbooks than GREAT reference books. Sensual photos, practical advice, clear descriptions of spices and how they are used. I love it. Thanks again for steering me to it. I am glad you like that book, too. I also have Monisha Baradwaj’s book, too, and love it as well. They are both awesome, and I am glad you have them both. They are some of the best resources out there. Thanks for the advice on beginner books. I just ordered Kuo’s and Yan-Kit’s from Ebay for under $20 combined(including shipping).